Nimble OS 4 has now been released as GAC (General Availability Candidate) and with this new OS comes new features for our customers. This blog concentrates on the new integration we provide with Nimble OS 4 and Microsoft Hyper-V and is the latest in the Nimble OS 4 - Detailed Exploration Series. Nimble has for many years provided Windows Host Utilities which allow our users to integrate Microsoft Volume Shadow Copy Services (VSS) integration for Microsoft SQL Server and Exchange Server. We actually did provide integration with Hyper-V in the form of a compatible Nimble VSS provider which could be leveraged by 3rd party backup applications, however with the release of Nimble OS 4, we provide support for a VSS Requestor for Microsoft Hyper-V, allowing our customers to schedule snapshot backups, manage snapshot retention, and replication of Hyper-V workloads directly from the array UI. 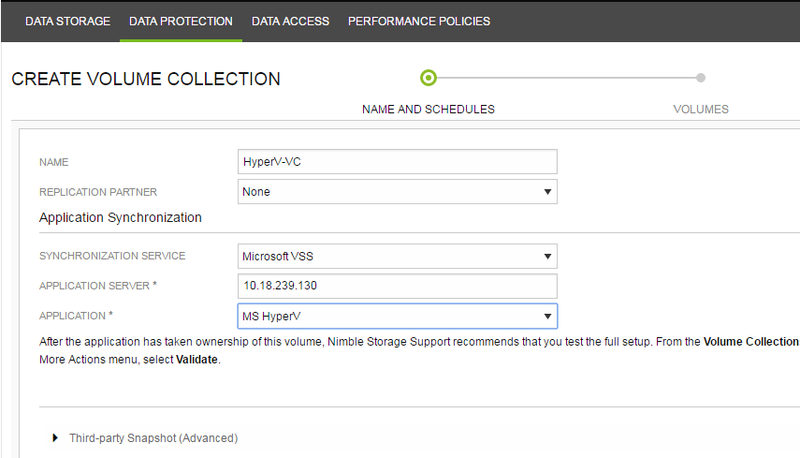 The first step to use this functionality, is to ensure you have the compatible array firmware (4.x) which you can request from Nimble Support (once GA it will be available to all Nimble Storage customers via InfoSight). Next you need to install the Nimble Windows Toolkit (NWT) on your Hyper-V hosts, it’s this toolkit which includes our VSS requestor and provider for Hyper-V environments. Once you have these in place configuring Hyper-V backups is very simple. Below is a screenshot of the workflow with Nimble OS 4. Notice that the UI has changed as we’ve adopted HTML5 in this release, but the workflow to protect volume collections is identical to prior versions. A deeper dive into the new GUI in Nimble OS 4 is available here. Now when you protect a volume, you can select the “Application” type from the drop down, and along with Microsoft SQL and Exchange, there is “MS HyperV”. When this option is selected at the scheduled snapshot backup time we will communicate with the Nimble VSS Requestor on the Hyper-V host(s), which in turn will speak to the Hyper-V and CSV VSS writers to quiesce the virtual machines prior to taking the Nimble snapshot. The virtual machines will require Hyper-V Integration Services installed inside them as Hyper-V will use this to take a guest snapshot in coordination with the Hyper-V and CSV VSS writers. The “Application Server” should contain the cluster name resource, or standalone host, FQDN or IP address so we know which host(s) we need to communicate with. As normal you’ll need to configure the schedule for snapshots, the retention for different schedules, and whether you would like to replicate to another Nimble Storage array. We support standalone volumes or clustered shared volumes (CSV) – we don’t however support traditional clustered disks. I would expect most Hyper-V users to deploy on CSVs. A mix of standalone and CSVs in the same volume collection isn’t allowed, so if you have both split them out in to separate volume collections. Minimum Hyper-V OS version supported is Microsoft Windows 2012R2 (with Oct 2014 rollup update). Windows 2016 is of course supported. If Hyper-V fails to take a guest snapshot for a particular virtual machine, via Integration Services, the backup will continue i.e. the Nimble snapshot will still be taken. The Windows event log will contain a report on which VMs were backed up successfully and which failed. The snapshot will fail if the VM is in the root of the mount point, so place virtual machines under a folder in the disk. When recovering from a VSS snapshot or importing from a cloned volume the VM will have a backup checkpoint. Apply this checkpoint prior to starting the virtual machine. I hope you found the blog useful, if you have comments or questions post them below. Thanks for the details Jason, this sounds great. So once I upgrade to Nimble OS 4, any issues with adding or changing protection to existing volumes to the new “MS HyperV” protection? Thanks! You will need to upgrade to the latest Nimble Windows Toolkit on the host(s) as well as the Hyper-V requester is built in to that. But once you've done that it should be case of upgrading to Nimble OS 4 and changing your protection policy on your volume collection(s) to use VSS/Hyper-V. Once you change the protection policy you should go to the volume collection and from the Actions menu select Validate which will check all communication between the array and VSS components are working as expected.